The DSA convention in Chicago showcases splinters among a growing, unruly left. There are now more than 25,000 official DSA members, a threefold increase from a year ago. 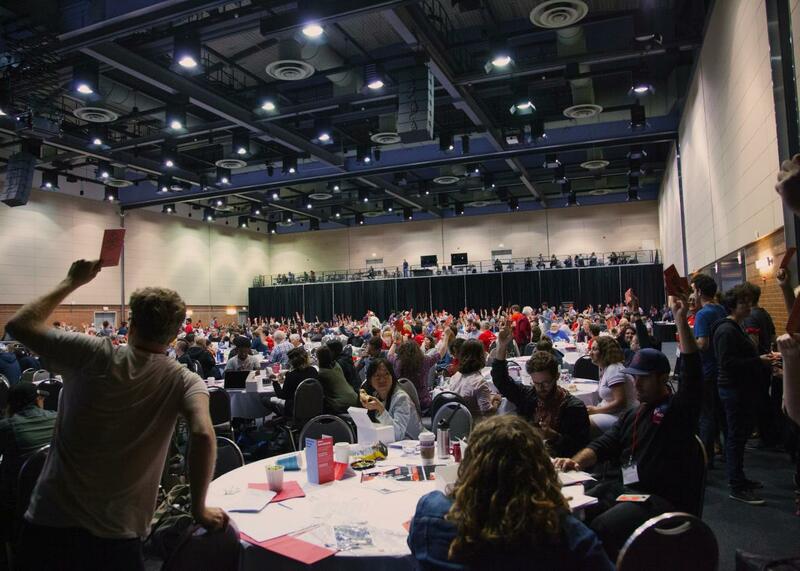 Nearly 1,000 socialists from around the country have gathered in Chicago for the Democratic Socialists of America’s biannual conference. They come just as the organization’s reached a milestone: There are now more than 25,000 official DSA members, a threefold increase from a year ago—after Bernie Sanders’ campaign demonstrated that a large mainstream constituency is willing to vote for a self-described socialist and before Trump’s surprise victory in November, which has heightened angst over the state of the Democratic Party and liberalism more broadly. Defenders of the Democratic mainstream routinely point out that unlike the DSA, the Democrats have a base of tens of millions of voters and ballot access. But the DSA isn’t a political party, although some would like to change that. What it is, precisely, and what it ought to become are up for discussion here in Chicago. There aren’t hard numbers about the DSA’s membership overall, but a picture of what their rank and file looks like emerged with the conference’s first events on Thursday evening. Most of the attendees seem to be under the age of 35 with a smaller but large contingent of old-timers who’ve been with the organization for many years. There are young, scruffy, and often bearded men aplenty who fit the BernieBro stereotype. But according to the DSA’s figures on delegates in attendance, 40 percent of the Chicago crowd are women, and 20 percent are people of color. That means, literally, the democratic governance of all firms by employees and local communities and the subjection of certain large industries—such as utilities, health care, and housing—to government planning and decommodification. Firms in most other industries, while “worker-owned and -operated,” would remain subject to market forces. This long-term vision separates democratic socialists not only from less democratically oriented and market-tolerant socialists (and communists) to their left, but also from the figure most responsible for their recent growth, Bernie Sanders. His self-description as a socialist and possibly more radical personal politics aside, the Sanders presidential campaign offered a progressive liberal agenda in keeping with the priorities that the Democratic Party’s left wing has advanced for years. A socialist will tell you that there exists a world of difference between saying, as Sanders often does, that no one working 40 hours a week should live in poverty and saying that poverty ought to be eradicated altogether—a goal shared by DSA founder Michael Harrington and the Democratic Party of the 1960s and 1970s, which Harrington advocated working with and within. Additionally, while Sanders supported single-payer health care and a $15 minimum wage, policy goals the DSA actively supports and organizes around, he didn’t advance proposals like a job guarantee or a universal basic income—policies currently being vigorously debated on the left and trickling into mainstream liberal discourse—or talk about the more fundamental reconstitution of the economy the DSA envisions. Importantly, the DSA sees policies like single-payer—ultimately a compromise position from the full elimination of profit from the provision of health care, which many DSA adherents hope for—as strategic steps toward that reconstitution. The DSA wants single-payer not just because they believe people have a right to health care but also because single-payer and policies like it help fundamentally shift the power dynamics between labor and the owners and managers of capital. These policies give workers more independence and economic leverage, which they can use to push for even more radical proposals, perhaps culminating ultimately in an economy democratically directed by workers. The national DSA convention in Chicago. In sum, the DSA would like to dismantle much of American life as it presently exists. Superficially, the group’s rapid growth might suggest that the number of people willing to commit themselves to this project grows by the thousands every month, with particularly large spikes owing to the election in November and Trump’s inauguration in January. But it seems probable that the Sanders-driven influx comprises more progressives sick of losing elections and eager to see the Democratic Party take on more ambitious domestic policy aims than it does people who have had epiphanies regarding questions of political economy over the past six months. Those progressives now share a large and increasingly crowded tent with members who have always wanted to see the DSA move further left. During the “Socialism Across Generations” panel on the first evening of the conference, the American Prospect editor-at-large Harold Meyerson’s self-description as a “third generation Menshevik”—the moderate faction that clashed with Lenin’s Bolsheviks during the Russian Revolution—drew a few half-serious boos from the audience. 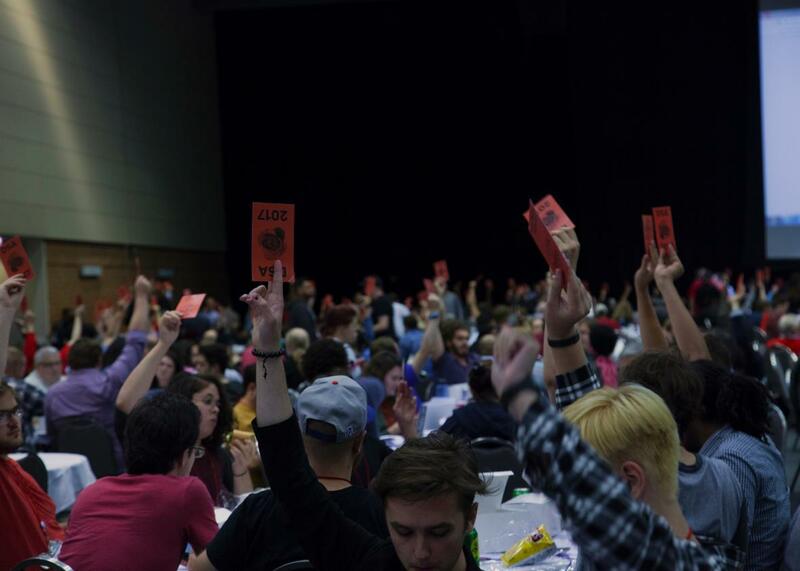 The guidelines also include language aimed at encouraging inclusivity, reflecting both the DSA’s commitment to expanding its tent beyond white guys and the movement’s ideological commitments to taking on not only what it sees as class oppression but also what Resistance Rising calls “systems of oppression” based on race, gender, sexual orientation, and ability. The badges handed out to all attendees have spaces for the disclosure of gender pronouns, and a variety of speakers have spoken to the importance of advancing “socialist feminism.” A resolution up for debate this weekend is on the abolition of prisons, one of the planks inspired by the Black Lives Matter movement. Organizationally, the DSA mandates that half of the slots on its 16-member National Political Committee, which functions as a kind of board of directors, be reserved for women and that at least four spots go to racial minorities.